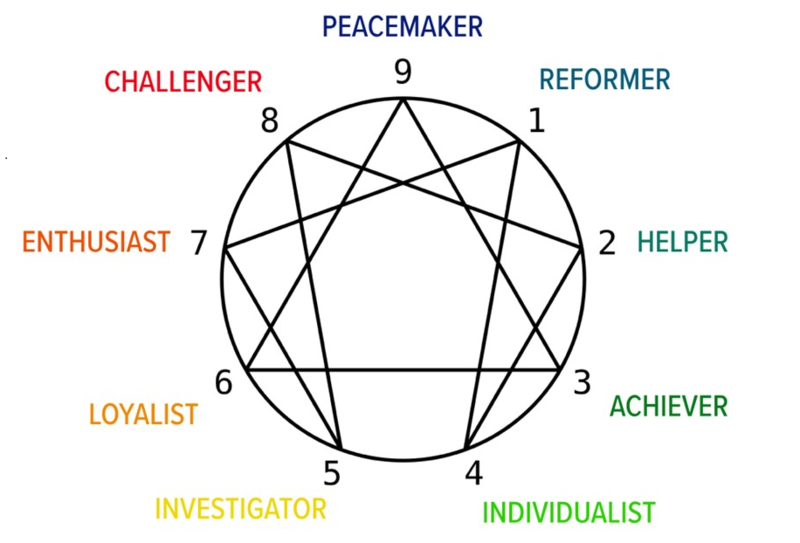 The enneagram, in simple terms, is a personality typing system that is made up of nine different types. The term enneagram comes from the Greek words ennea, which means nine, and grammos, which means a written symbol. The types each have different ways of thinking, feeling and acting based on an inner motivation or worldview, according to The Narrative Enneagram. Each of the nine types have a set of distinct personality traits. A person usually identifies with one specific number, which is your dominant type. Yet, you can also exhibit traits from other numbers. Because of this, there are wings. A “wing” is one of the two types adjacent to your basic type. The Enneagram diagram is made up of three parts; a circle, an inner triangle which connects 3-6-9. It also is made up of an irregular hexagonal “periodic figure” which connects 1-4-2-8-5-7. Here is a quick look at the types in one-word descriptors, as described by The Enneagram Institute. Note that these are only highlights and do not represent the entire spectrum of each type. Type one, the reformer, is principled, purposeful, self-controlled, and perfectionistic. Type two, the helper, is generous, demonstrative, people-pleasing, and possessive. Type three, the achiever, is adaptable, excelling, driven, and image-conscious. Type four, the individualist, is expressive, dramatic, self-absorbed and temperamental. Type five, the investigator, is perceptive, innovative, secretive, and isolated. Type six, the loyalist, is engaging, responsible, anxious, and suspicious. Type seven, the enthusiast, is spontaneous, versatile, acquisitive, and scattered. Type eight, the challenger, is self-confident, decisive, willful, and confrontational. Type nine, the peacemaker, is receptive, reassuring, complacent and resigned. How can you know your number? You can self-identify your Enneagram type by simply reading the descriptions and picking the number you think best describes you. Or, you can use a formal Enneagram assessment. Using an assessment can aid in self-awareness, self-understanding and self-development, which is why most people choose this route. There are also several different books and studies about the Enneagram. The Road Back to You: An Enneagram Journey to Self-Discovery, is a book that helps you understand more about yourself. It provides in-depth yet easy-to-understand descriptions that help you figure out who you are and why you may constantly be stuck in the same situation. Keegan Stewart, a Mass Media Communications major from Grants, N.M., is hosting a podcast series about the Enneagram and speaking with individuals from LCU. Each podcast focuses on a specific number. Look for “The New Creation” podcast on iTunes or Spotify.